A celebration of individuality and the power of laughter. Based on the classic children’s book series by David McKee (celebrating its 30th birthday this year). Elephants – as everyone knows – are big, have trunks and are grey. 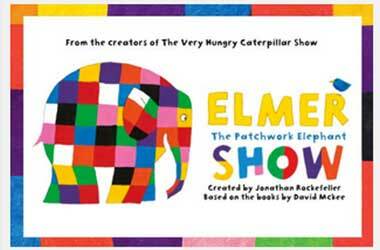 But Elmer is a patchwork of brilliant colours ! His fun-loving and cheerful personality keeps everyone in a playful mood, until the day he gets tired of being different and tries to blend in with the herd. Featuring a menagerie of 21 loveable puppets, this show tells the tale of an elephant that stands out – both with his patchwork-coloured skin and his sense of humour – and realizes that his friends have always valued his unique characteristics. The show’s subtle message that it is always best to be yourself. Approximately 50 minutes without any interval. Thursday & Friday : 5.00 p.m.
Saturday & Sunday : 11.00 a.m., 2.00 p.m. & 4.30 p.m.